(Nanowerk News) Experiments at Johns Hopkins have unearthed clues about which protein signaling molecules are allowed into hollow, hair-like “antennae,” called cilia, that alert cells to critical changes in their environments. So-called “primary cilia” have been attracting intense attention as recent research has confirmed their role in monitoring the cell's exterior environment and conveying information to the rest of the cell using an arsenal of signals stored inside the thin interior of each antenna-like cilium. The results of this study, which help explain how that arsenal is developed, will be published online in the journal Nature Chemical Biology ("Chemically inducible diffusion trap at cilia reveals molecular sieve–like barrier"). 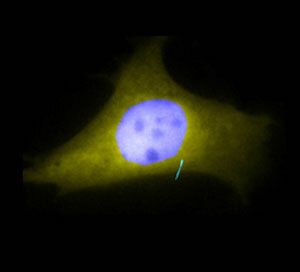 A cilium stands out in blue fluorescence against the yellow fluorescence of the rest of the cell.